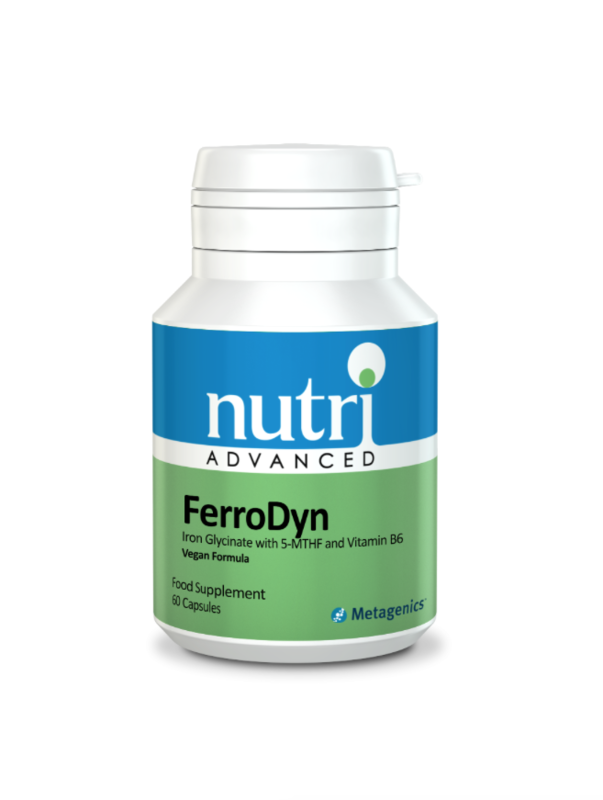 FerroDyn® provides iron bisglycinate, folate as 5-methyltetrahydrofolate and vitamin B6, to support the formation of red blood cells, energy levels and reduction of fatigue. Provides iron as bisglycinate, a highly absorbable form of iron, which is gentle on the GI tract. Iron is crucial for the formation of red blood cells, and it supports energy and the reduction of tiredness and fatigue. Provides folate as 5-methyltetrahydrofolate (5-MTHF), the biologically active, "body-ready" form of folate that requires no additional metabolic steps in order to be utilised by the body. Ideal for those whose folate status may be affected by genetic variation. Provides vitamin B6, which contributes to normal red blood cell formation. Take 1 capsule daily, or as recommended.